The HL5M automatic Godwin Dri-Prime 6" x 6" (150mm x 150mm) centrifugal pump is an extremely powerful yet compact high pressure pump with flow capabilities to 1450 gallons per minute (91.5 l/sec.) and discharge heads to 500 feet (152.4 M). In addition, the HL5M features the unique Godwin high pressure oil bath mechanical seal design that allows for totally dry running for indefinite periods of time while automatically priming and repriming. Able to perform in the toughest conditions, the HL5M can pass a solid to 1-3/8" (35mm) in diameter, making it a high pressure trash pump as well as a superior dewatering pump. The powerful HL5M has already proven itself a pump of choice for mines, quarries, temporary fire pump systems and many other high pressure applications. 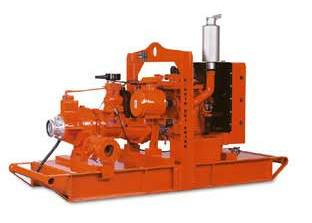 • Close coupled automatic priming 6" x 6” (150mm x 150mm) centrifugal pump mounted to a diesel engine. Also available in electric drive or as bare shaft pumpend. • All cast iron construction with cast chromium steel impeller. • Extensive application flexibility — will handle liquids with solids up to 1-3/8" (35mm) in diameter. • Continuously operated “Godwin” venturi air ejector priming device featuring belt-driven air compressor requiring no form of periodic adjustment or control. • Dry running, high pressure, oil bath mechanical seal with abrasion resistant solid silicon carbide interfaces. • Solids handling swing type Non Return Valve with renewable flexible rubber seat. • Compact unit mounted on a skid base or two wheeled highway trailer, both incorporating integral overnight running fuel tank. • Standard engine, Caterpillar 3126TA. Available with a variety of engines including John Deere, Cummins and Deutz. • Low profile side discharge for easy pipe connection.